Winter or Summer there is always something to do around Mývatn. From the Nature Baths, to all the points of interests in the nature. Jarðbodin – Nature Baths: Nobody comes to Mývatn without having a dip in the Nature Baths. It’s been called the” Blue Lagoon of the North”, but let’s be honest … It‘s way better. Enjoy the midnight sun during the summer or the northern lights during the winter. 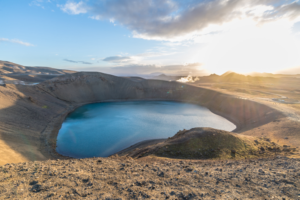 Víti Crater / Krafla Area : “It’s like landing on another planet” – The contrast to the lush green vegetation around Lake Mývatn will stun you when you’ll arrive in the Kafla Area. The geothermal area around Krafla is considered one of the most active in whole of Iceland. Vindbelgjarfjall – 1h to the top – Probably the best view of the lake, it is close and high, a bit steep, not suitable for young children. Hverfjall – 30 minutes up, add an extra hour to walk around the rim. Hofði and the Lava Pillars : A 10 minutes drive will bring you to Hofði, the forest by the lake. Pass the gate and climb up to admire a beautiful panoramic view of the lake and the lava pillars. 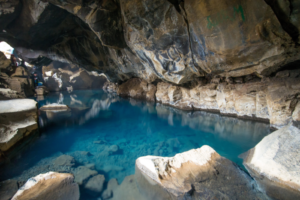 Grjótagjá : A beautiful cave with two entrances, naturally half filled with geothermal were people used to bath in (too hot now) – Fun Fact – Games of Thrones : Jon Snow and Ygritte bathing scene was filmed there. In addition to all this, there are almost endless opportunities for outdoor activities all year round, it´s possible to play minigolf, bowling, icefishing, cross country skiing, fat biking or snowmobile riding on frozen Myvatn during wintertime, private superjeep tours to Askja or to see the northern lights, birdwatching or simply visit Mývatn Bird Museum. Please do not hesitate to contact us to find the activity that suits you best.